We’d love your help. Let us know what’s wrong with this preview of Tolkien's Ordinary Virtues by Mark Eddy Smith. For Christians who are fans of Tolkien, Smith compares the tales of the Hobbits to those of spirituality, wherein God calls those that listen to embark on a journey. To ask other readers questions about Tolkien's Ordinary Virtues, please sign up. 3.5 stars. Very approachable, and great for quick reference and clear explanations. I would have loved if each chapter had been more fleshed out. I would probably have given this easy guide to the many theme's in LotR 5 stars if not for the many religious comparisons. Friendly, thoughtful, and just long enough. Great analysis! It just makes me also very aware that it's been way too long ago that I last read the Lord of the Rings, plus that I probably read it when my English was not actually good enough to fully understand it. I should read the Lord of the Rings again soon! Not as good as "Walking with Frodo" or "Walking with Bilbo", but very very good! This is geared to fans of the books, and doesn't really include anything about the movies, which is actually a very good thing for fans of the books. Particularly "older" fans. (People who read and loved the books before the movies came out.) If you love the books, you will enjoy this one as well. It's amazing to me how many profound spiritual insights are packed into this slim book. I will be re-reading and referencing this one for years to come. It is beautifully and sensitively written for any Christian who is drawn to LOTR for its many deeply Christian parallels. One of the biggest reasons that I love the LOTR so much is how it compliments scripture so deeply, and even amplifies the mysterious and unknown qualities of the Bible (as in The Simarillion) in awesome ways. A thoughtful analysis of Tolkien’s Christian an moral themes. Jim Belcher should have read this book. 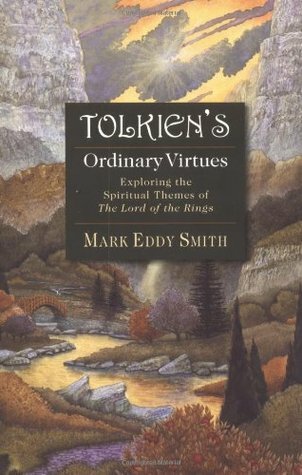 Mark Smith's book, Tolkien's Ordinary Virtues, is filled with interesting and thoughtful insights into the moral and ethical foundation of J.R.R. Tolkien's books. I listened to the audiobook version, just after finishing The Lord of the Rings trilogy and The Hobbit, and it certainly gave me a better appreciate for the lessons embedded in the book. For the reader who wants to gain a better understanding of these aspects, I would recommend Mr. Smith's books. 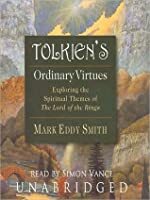 Having said that, I gave the book 3 star Mark Smith's book, Tolkien's Ordinary Virtues, is filled with interesting and thoughtful insights into the moral and ethical foundation of J.R.R. Tolkien's books. I listened to the audiobook version, just after finishing The Lord of the Rings trilogy and The Hobbit, and it certainly gave me a better appreciate for the lessons embedded in the book. For the reader who wants to gain a better understanding of these aspects, I would recommend Mr. Smith's books. I've read a couple of other books about Tolkien from a faith perspective, but didn't care for them all that much. The austere Catholicism that imbues his work almost imperceptibly was not well-served by the others' overt evangelical Protestantism, although I certainly have no objection to the latter as a thing in itself. This book is insightful and strikes just the right note, in my view. Eddy devotes different chapters to spiritual virtues such as generosity and sacrifice, introducing the occas I've read a couple of other books about Tolkien from a faith perspective, but didn't care for them all that much. The austere Catholicism that imbues his work almost imperceptibly was not well-served by the others' overt evangelical Protestantism, although I certainly have no objection to the latter as a thing in itself. This book is insightful and strikes just the right note, in my view. Eddy devotes different chapters to spiritual virtues such as generosity and sacrifice, introducing the occasional biblical quotation alongside a discussion of how various characters put them into action. The parallels are gently drawn out from within the story itself; they do not feel imposed by the author's agenda. In this book, Smith shows how the actions of Tolkien's characters exhibit common virtues that we all should strive to develop. Some of these virtues I had found myself, others add more meaning to the Tolkien's masterpiece. I have long struggled to articulate why I despise Peter Jackson's movies. This book has given me the means to do so. Like Mark Smith when I was young I recognized something of the Bible in Tolkien's work--especially after I read the Silmarillion. These books have become a part In this book, Smith shows how the actions of Tolkien's characters exhibit common virtues that we all should strive to develop. Some of these virtues I had found myself, others add more meaning to the Tolkien's masterpiece. This is a nice devotional type of book, one that gets you into the mode of thinking of the virtues inherent in Tolkien's trilogy The Lord of the Rings. It contains no special insight into Tolkien's own life, beliefs, or intent. Rather, it consists of Smith's own thoughts as he applies LOTR to life. Any religious person could come up with the same ideas. Still, it enjoyed this book and the points it brings out. I read this book when doing research for my undergraduate thesis, and it really did not contain anything I hadn't seen already or knew myself. Smith stays close to the surface of each virtue that he explores, only giving two or three pages to each section. If you are a serious Middle-earth lover, I would suggest passing this one over. If you're new to Middle-earth and haven't done much extra reading, this might be a good place to start. I love Tolkien, and his books, so I'm super disappointed to be lukewarm about this book. It's one of my favorite authors with one of my favorite topics--spirituality--so how could this not be awesome? Because it's pretty flat, that's how. It feels a lot like just praise of how great Tolkien's writing was, which is true but not really book-worthy. There are some great quotes, but overall I was just not impressed. A short little book pointing out some of the themes that lie embedded in the story but are too easily missed or not thought upon distinctly. When my children first read the series I'll certainly use this little book to aid good conversation about it. It could have said a good bit more, all the same. Perhaps the book I got recently, 'The Philosophy of Tolkien', will build on what Eddy has said. I can't recommend this book highly enough. If you are in need of spiritual recharge, this is the book. I have read it repeatedly since I bought it and I'm never tired of it (which is more than I can say for LOTR, actually). This is a beautiful homage to the Authors favorite author--a short but extremely uplifting and inspirational book. Recommended to fans of fantasy and inspirational novels. Some nice reflections on virtues as expressed in LOTR. From a Christian perspective - that's appropriate, as it is where Tolkien was coming from, but at times does stray a little into Sunday School territory, I feel. I would have enjoyed it more if instead of telling me what to think it prompted me to look at the text and think for myself, but that's just me. "Reading or writing about the virtues of fictional characters has little power to instill those virtues in us. Yet good books can gives us a template, a way of understanding the world, so that when our time of testing comes, when the deed is set before us that we alone have been called to do, we will know the choices we have to face"
I really enjoyed the short essays here, devotional meditations on virtues such as faith, hospitality, wonder, temptation and failure. I'm not a Tolkien scholar, nor do I know much about Middle Earth. It was wonderful to have someone connect the spiritual dots for me, pointing out specific scenes where the spiritual themes occur. Good book for both private pondering and a group discussion. This book explores several ordinary "workaday" virtues (such as generosity, sacrifice, and hospitality) demonstrated in The Lord of the Rings (and The Hobbit and The Silmarillion). Each chapter includes Bible examples and verses. I was underwhelmed; there's nothing especially deep, enlightening, or thought-provoking. It started out weak and shallow to me, but as I read on I got the hang of his writing. At times I felt like he was trying to"baptize" the story or make it Christian in nature which I'm not convinced is what Tolkien intended. He is not C. S. Lewis, just his friend. But this book did help me recall the Lord of the Rings stories in a new way. So Virtues is okay. Nonostante a tratti sembri impartire lezioni di catechismo, si tratta di un libriccino interessante. Dà una prima infarinata sulle influenze della profonda fede cattolica di Tolkien ne Il Signore degli Anelli. I capitoli sono brevi e rendono il libro estremamente scorrevole, mentre i riferimenti all'opera di Tolkien sono chiari (almeno per me che ne sono un'adoratrice). This book is a helpful and refreshing reminder to us of the many virtues that are displayed in The Lord of the Rings. These virtues are important in our everyday lives and should be remembered more often. Mark Eddy Smith does a excellent job at capturing these virtues. I enjoyed this book chiefly because I enjoy reading about Tolkien's work. I didn't find that the author contributed any dazzling insights; the spirituality was confined to Christian teaching. However, the book was pleasant, if a bit shallow and moralistic. The Lord of the Rings is one of my books. As a Christian I saw many themes interwoven throughout, however, Smith does a wonderful job in pointing out the virtues and how they were written as not only part of the story itself but the Characters as well. Simon Vance narrated this entertaining and insightful study of one of my very favorite works, The Lord of the Rings. This is one I will listen to again, and now I'm ready to track down an audible version of the actual books and give them a listen.